Saints are on the march again. BYU’s Taysom Hill and Utah’s Marcus Williams will have a home-field advantage Sunday. A Super Bowl appearance at age 40 for QB Drew Brees would be another career achievement. New Orleans' drive to this week's NFC championship game covered 112 yards. The Saints' go-ahead march vs. Philadelphia in the third quarter of last Sunday's divisional playoff game started at their 8-yard and lasted 18 plays and 11-plus minutes. Because of penalties, New Orleans needed 20 more yards to reach the end zone and help extend its season. Nine years after winning the Super Bowl, quarterback Drew Brees and coach Sean Payton are on the verge of another trip. Brees, who turned 40 this week, is approaching Tom Brady standards of longevity. As they showed in the last three quarters against Philadelphia, the Saints may have the defense required to reach the Super Bowl. The Saints went 13-3 in the regular season, including a 45-35 defeat of the Rams in early November, to win the NFC South and earn the conference’s No. 1 playoff seed. New Orleans beat Philadelphia 20-14. Tribune sportswriter Kurt Kragthorpe introduces the four contestants in Sunday’s NFL championship games. This installment: New Orleans Saints. Former BYU quarterback Taysom Hill is used creatively on offense and special teams. On that epic drive against Philadelphia, he was involved in two would-be touchdowns on consecutive plays — barely missing a reception, then having a TD pass called back by a penalty. Earlier, Hill ran for a first down on a fake punt. Former Utah safety Marcus Williams started all 16 regular-season games for the Saints and made two interceptions, giving him six in his two-year career. 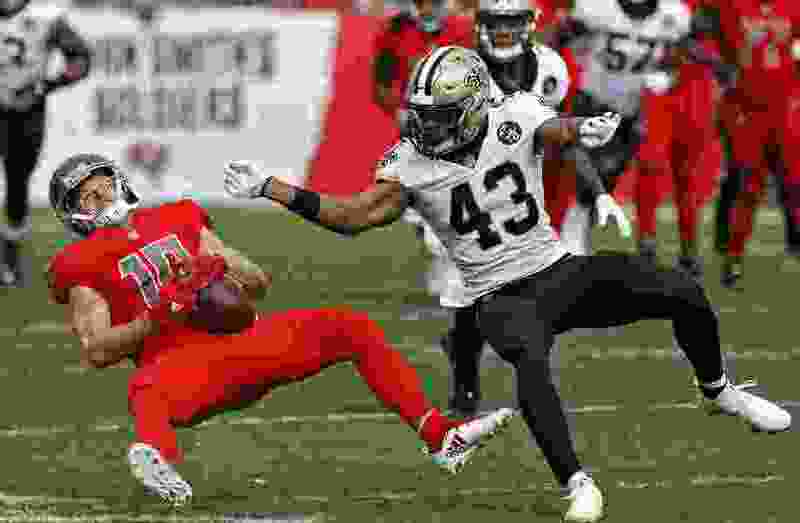 The Saints' advancement this month enabled Williams to overcome the memories of last January, when he missed a tackle on Minnesota’s miraculous winning play in the divisional round. Vince Biegel, a son of former BYU star Rocky Biegel, is a reserve linebacker. Tomasi Laulile, a defensive tackle from BYU, is on New Orleans' practice squad. Saints running back Mark Ingram was an Alabama freshman in the 2009 Sugar Bowl vs. Utah. Ingram gained 26 yards on eight carries as the Crimson Tide’s No. 2 back in a 31-17 loss in New Orleans. He won the Heisman Trophy the following season. Michael Thomas, receiver. He caught 12 passes for 211 yards in the November meeting with the Rams, who were missing veteran cornerback Aqib Talib. Terron Armstead, offensive tackle. He made the AP All-Pro second team and is vital to the Saints' protection of Brees. Brees is one of the NFL’s best people off the field, and his remarkable career would be enhanced by another championship. As is the case with the New England Patriots, a title for the Saints would result in Super Bowl rings for both Utah and BYU players.